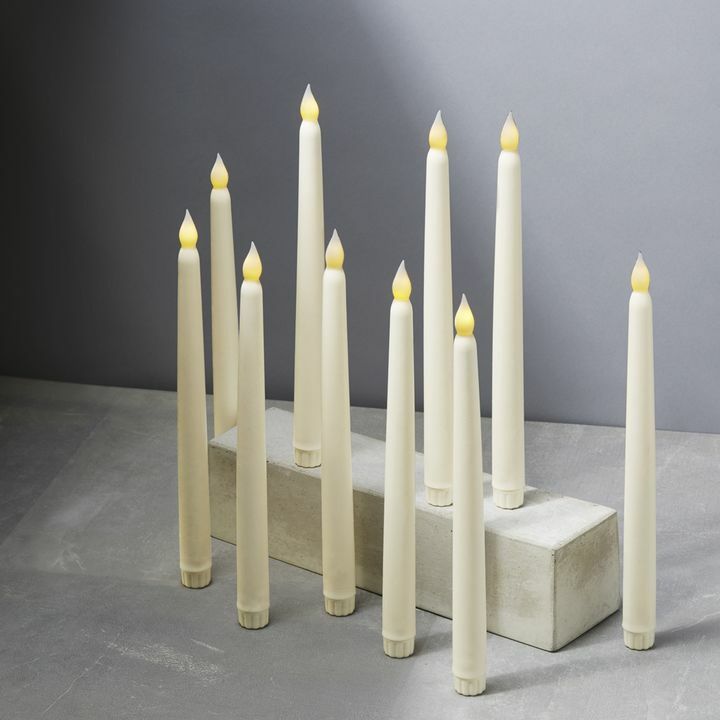 There are only 188 available of the Ivory Wax 10" Vigil Taper Candles with Glass Candleholders, Set of 6. Your selected quantity has been adjusted. 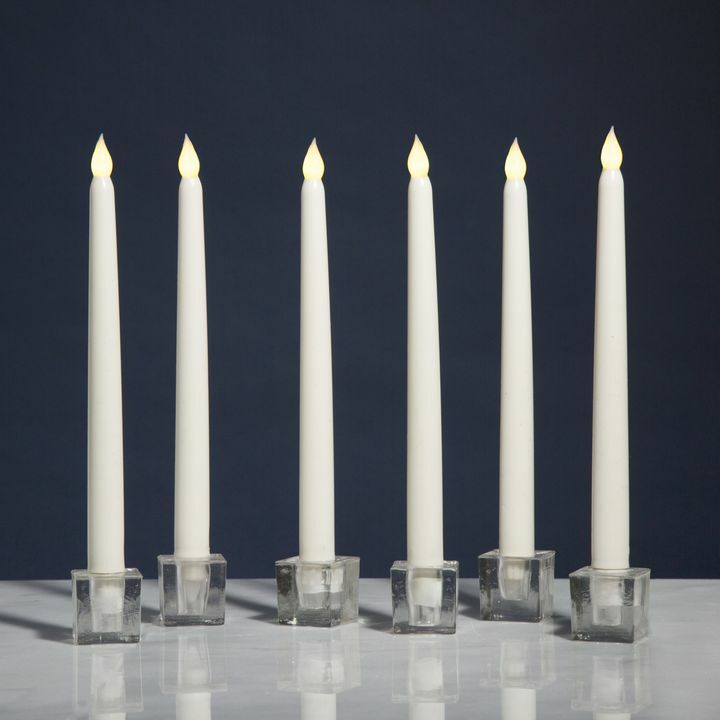 A set of 6 flameless taper candles with glass holders included, transition seamlessly from dinner parties to special occasions and ceremonies. 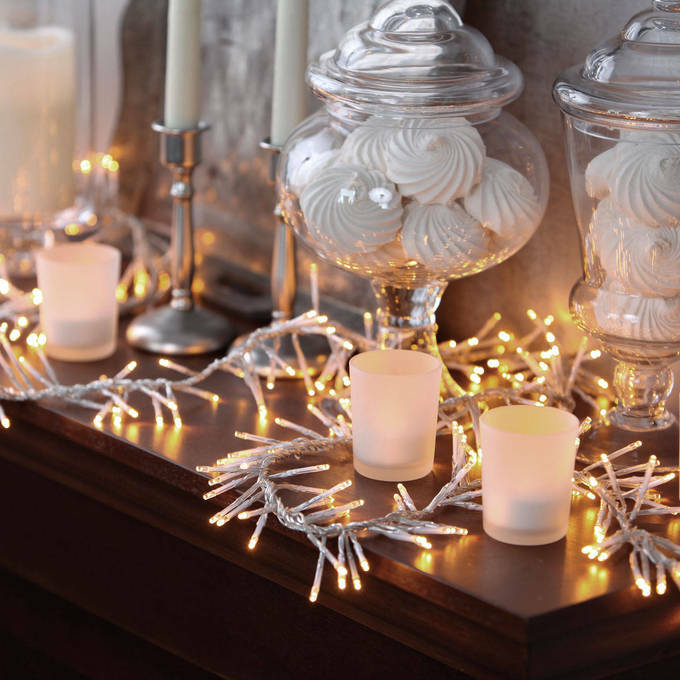 Use these as a safe, all-in-one alternative for banquet table lighting or classic decor on your fireplace mantle! 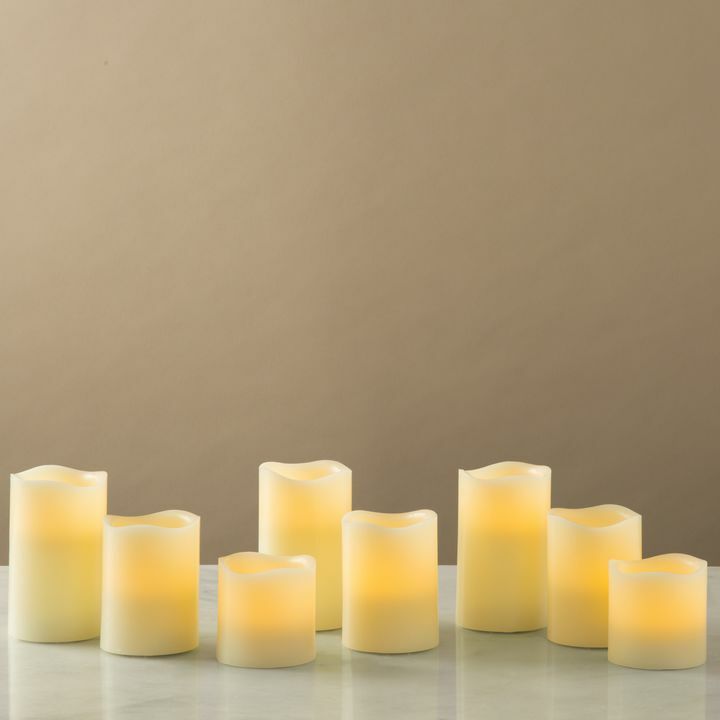 Each taper candle's slim design and wax dipped body, highlighted by warm white flickering LEDs and cleanly designed candle holders, are both high in quality and hazard free, unlike their traditional counterparts. Perfect for home, weddings, churches, restaurants, and events. We use these for our Sunday School program classes on our prayer tables...we bring the "Light of God" into each classroom of kiddos and don't have to worry about a real flame. Thank you...great, quality product!! These are sooooo nice! Packed well and arrived in timely manner! Thank you! These wax tapers will fit many different candleholders & candelabras. To be used for wedding catering. Very pleased! Will visit this site often! I love love the candles and glass candles stand. They are very elegant and they will complement the centerpieces. I love these taper lights so much. They were packaged very neatly, the glass holders were individually boxed. 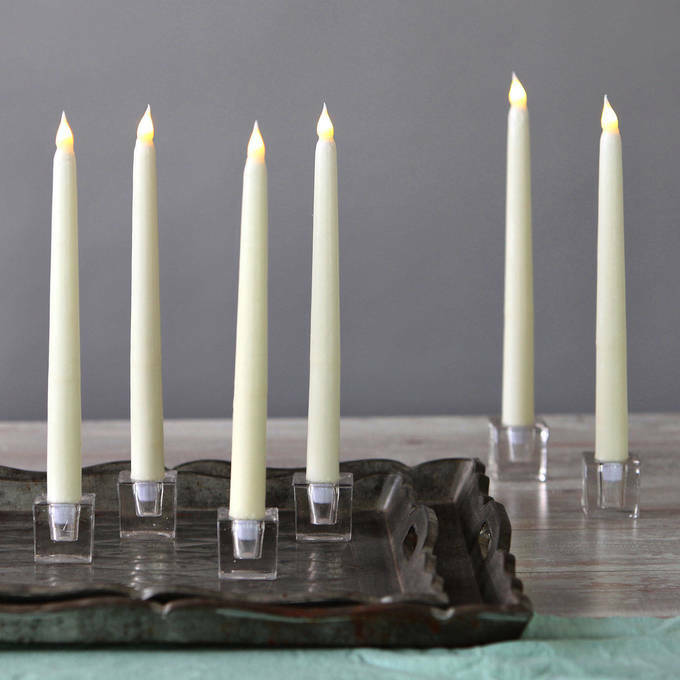 These candles are so well made: you can tell the first time you pick one up. Great candles. Real wax and realistic 'flame'. Made for a nice candlelight family dinner. Very fun. 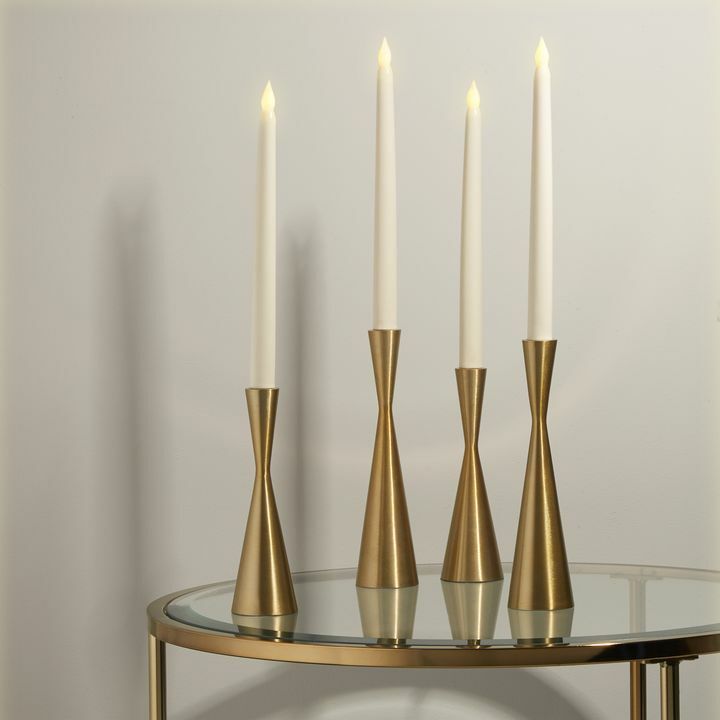 These long tapered candles are so life like. They are coated in real wax. They have a square detachable glass holder that appears as crystal when lights are on. Batteries are also included. Just love them! Nice candles! There are some nice touches like a "flickering" flame, and the candles feel waxy. We are looking forward to using them in the historic houses in our museum. I love the Tapers and holders. hard to find them together. I love that the batteries were included - these were perfect for a stage set. Nice flicker, nice shape. I absolutely love these candles! I have them in my candelabra on the dining room table. Look beautiful & they give off a lovely glow! No more wax on my tablecloths & no worries about fire! We made 2 sets of "risers" so we could place 3 flickering candles -- in graduating heights -- on either side of a large altar centerpiece at our wedding, and the effect was lovely. The candles "performed" perfectly! Is the candle Flame a bulb or wavy plastic flame shape? Is there a remote for this set? 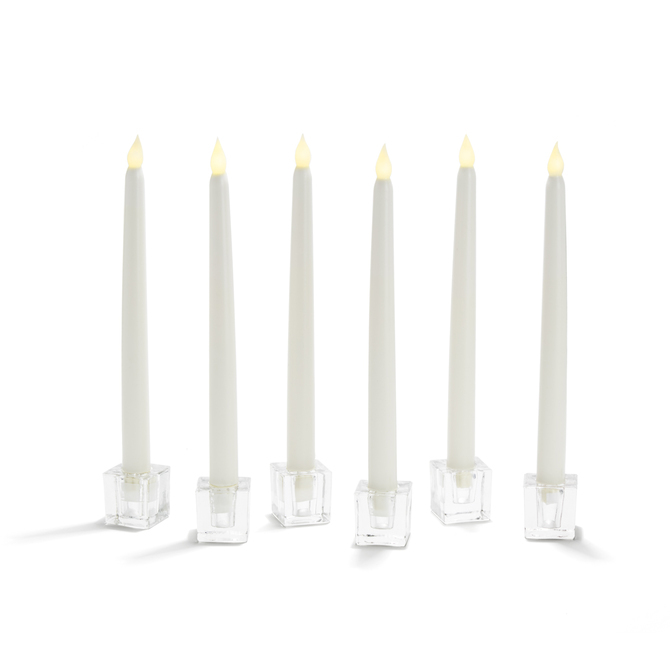 The Ivory Wax 10\" Vigil Taper Candles with Glass Candleholders do not come with a remote and are not made to receive remote signals. Do these have on/off twist bases? Can the glass holder be taken off? The glass holder is removable.